This Villa style is the most prestigious 3 bed property on Polaris World's flagship resort El Valle. A very large villa (280m2) on plot size 760m2 with it's own large private pool (Solar heated), Hydrotherapy Hot Tub(Villa Azul) and 5 Hole Putting Green! It has a large conservatory area, 2*BBQ's, 3 large bedrooms (all fitted wardrobes), 3 bathrooms, spacious kitchen (incl. microwave, dishwasher & American style fridge) and an ample utility area, consisting of an outside sink and washing machine/dryer. The villa overlooks the Par 3 12th hole in a fantastic elevated private position. The course is fast gaining a reputation in this unspoilt area and hosted the European Seniors Tour Event in May 2011....and is the most exclusive place to stay if you want the best in luxury and prestige. The spacious living area with its vaulted ceilings, combines traditional Spanish style architecture with contemporary furnishings for a truly luxurious experience. European Seniors Tour Event 18-20th May: El Valle hosted the European Seniors Tour 'OKI Spanish Seniors Open' in May 2011. Sky Sports covered the event and you can still catch highlights on YouTube. We are a small family business based in the north west of the UK. We have been renting out our property since 2008 and have an excellent record. We have numerous guests who come back to us year after year and we believe that we provide many more facilities than others, making our villa great value for your holiday. toilet, combination tub/shower, bidet, This is en-suite to the master bedroom.Whirpool bath. The quality of fittings and the spaciousness of the bathroom all contribute to your luxury holiday experience. Egyptian cotton fluffy white towels are provided. A Wide range of Books are provided. As well as a few outside games, cards and a poker set is provided. A wide range of CD's are provided. An area incl. BBQ and frontline golf view is shaded by a purpose built pergola. We provide adult and junior tennis rackets and padel tennis rackets for use on the on-site tennis court and Padel tennis court. We provide upto 8 adult sets, 1 left handed adult set and 2 junior golf sets. Your own large (9m x 4.5m) solar heated pool is provided for your private use. There are several larger communal pools available on the resort for your use. 10 mins walk. A 42 jet hydrotherapy hot-tub is available for your use. Beach/pool towels provided. Personal introduction to villa by English speaking key holder available. Welcome packs available on request. Hairdryers and straighteners provided. Although predominantly a non-smoking property, guests who smoke are asked to refrain from smoking inside the villa and conservatory area - we hope you respect our request. We were very impressed with the villa and facilities. The villa was very spacious and clean with everything we needed for our holiday. The location overlooking the great el valle golf course was perfect. Other courses were just a short drive away. We received great customer service from the owners who provided everything we needed and did not surprise us with hidden costs which we have experienced before. We would very much recommend to other golf travellers or families. Just back from a truly superb week at the Villa. The owner Mary was great in every way in helping us with all the info you could need beforehand. The Villa itself is wonderful and it's huge, offering everything you could need. The pool is great and everything is of a high standard. All sorts of pool toys for the kids (or adults in our case) to keep you occupied whilst basking in the sun. All the rooms are huge and the overall space is great and the AC running throughout makes it so comfortable inside. The golf course is fantastic and I've played all over EU, UK & UAE and we didn't play anywhere else as it was so good. The clubhouse has a lovely restaurant but if you want to eat elsewhere or explore, a car is a necessity. We hit local shopping malls, other tourist areas and La Manga eating at some great places, watching the sun set over the Mar Menor. We loved the privacy and peace and coming back to it after meals out was really nice, just what we needed. We're already planning our next trip back there as it ticks all our boxes and is therefore highly recommended by me. Thanks Mary, we had a great time. Thanks for this feedback, we love to know that guests have enjoyed their stay. It makes all our hard work worthwhile. Prefect getaway for family and friends in the sun! We can’t not recommend this villa enough. The resort is peaceful and the villa has everything our little ones could wish for to entertain them. The villa is beautiful inside and out and is of a very high standard and really clean. Nothing is too much trouble and the booking process flawless. This is our 2nd stay at the villa and we are going back next year – just perfect for a family and friends getaway in the sun! Had a superb holiday, villa is great we slept 4adults 4children and a baby very easily. The pool was fanatstic and the outdoor area was even better than the photos suggest. You do need a car but to be honest you could get by without leaving the resort. Very quiet perfect for a young family on a relaxing holiday. We have rented on El Valle before, both Alcor and the larger Algarba style villa's. We chose to return, again picking the larger of the two styles, specifically Roja as it is well kitted out for the family. The El Valle resort is far from the crowds but very safe and super quiet. As there is not much going on apart from the very impressive Golf course you have to make your own entertainment and enjoy a more quiet, relaxing style of holiday. You will need to drive a minimum of 15 mins to get anywhere at all. Once off site there is anything you could ever possibly want once you have travelled that 15 mins. The well stocked onsite supermarket has everything you could need should you not want to venture out and is not unreasonably priced. It has long opening hours and great fresh bread every morning, we made fetching the bread for breakfast a job for the kids. Villa Roja has everything you need for those long, lazy days by the pool, BBQ's, eating outdoors and sipping a glass of red late into the evening. Having an internet connection was very useful. The kids loved the PS3, Putting green, Bowls, Tennis rackets Table tennis, games etc and we got some great family time playing with them as well as time chilling out. The Swimming pool was clean and the solar heating added a little extra temperature. Hot tub a nice addition. The villa is in very nice condition, with lots of space and a feeling of luxury. This quality of accomodation is hard to match outside this type of resort. Great comunication from the owners who have put a lot of thought and effort into making this a great holiday rental. If you do choose to rent it please keep it nice as we will be coming back! The Costa Calida, Spain’s warm coast, is certainly deserving of it’s name. With over 320 days per year of sunshine there are more sunny days in the Murcia region than any where else in Spain with average temperatures of 21 degrees cent. Our luxury villa is only 20 mins drive from the fabulous beaches of the Mar Menor, with it's bars, restaurants and water sports facilities. Soft sandy beaches with numerous children’s play areas on the sand, coupled with the calm waters of the Mar Menor make it ideal both for children and for the extensive water sports that are on offer here. These include Jet skiing, wind surfing, sailing, fishing, snorkelling, and scuba diving. The cities of Murcia & Cartegena both boast excellent cultural and shopping facilities. At San Javier just 20 minutes drive away is Dos Mares shopping mall and towards Murcia, 20 minutes in the other direction is Nueva Condomina both of which include 10 pin bowling, cinemas and an extensive food halls. Golf: Polaris World presents the best golf offer in Europe - The Nicklaus Golf Trail, which currently includes El Valle, La Torre, Mar Menor (9 hole) and Hacienda Riquelme. The excellent designs ensure fun for all players, whether novice or expert with a different challenge every day and with free shuttle buses between the resorts, you can relax and enjoy a drink at the 19th. El Valle is quickly becoming THE course in the South East of Spain, with rave reviews from all levels of ability. The magnificent club house contains a Supermarket, Bar and Restaurant. We play golf and so understand what you want from a weekend away golfing; cheap flights, short transfers from the airport, golf on your doorstep on challenging courses, no cooking!, playstation games and loads of beer! 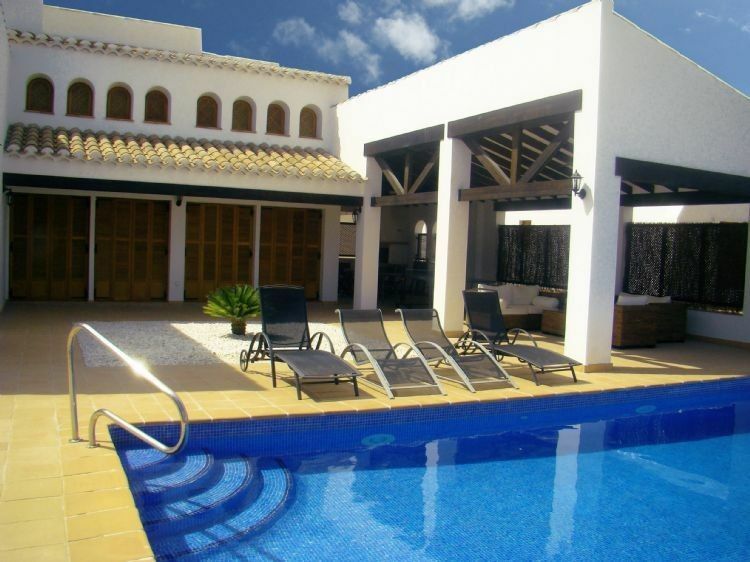 This villa can provide all that along with fantastic accommodation and your own private pool! All at the same price as you would pay to rent an apartment on a lesser resort....so why go anywhere else? Tariff: INCLUSIVE OF CLEAN. Except for Late Deals/Special Offers when there is an additional £90 charge. The prices above are for one FULL week. Prices include linen and towels, including beach/swimming pool towels. To add additional days/nights to a full week booking, add a pro-rata weekly rate to the booking. We're open to reasonable negotiation on rates on normal prices(not late deals.